Revolution 222 is an adventure, an engrossing page-turner about how one man's idea changed the world. What if a single idea, originating from one mind, could change the world? What if all that it took was one person, the right person, awakening to the realization of a new dream? Could it be you? …Would you recognize it - if it happened to you? 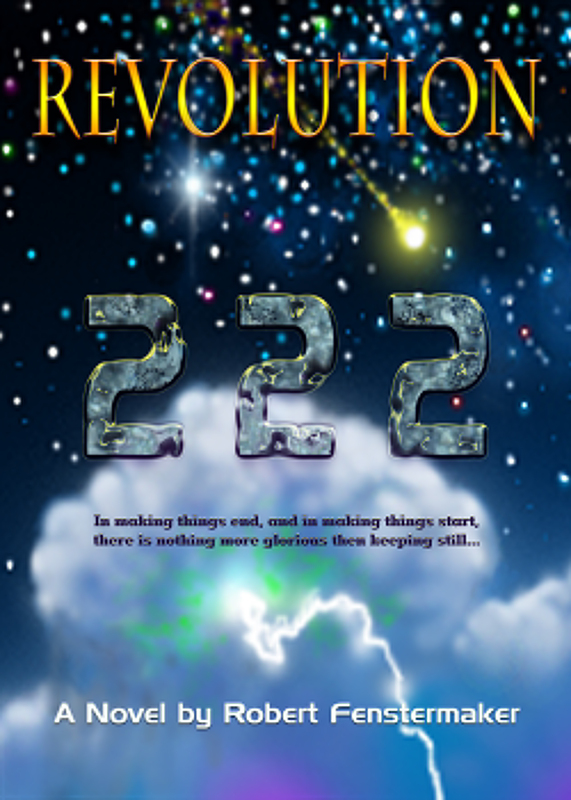 Revolution 222 is an exciting adventure story about how one man's scribbling in a notepad leads to a revolution, a revolution where people all over the world suddenly discover that the path to enlightenment isn't as difficult as they thought. It goes beyond philosophies that claim freedom and peace of mind can only be obtained when you do not react to fear or greed; your energy is instead spent creating a powerful alternate reality in which you can be happy and thrive. If you like adventure, intrigue, FBI hunts innocent poor loner while the world goes nuts over his ideas (and a damn good yarn about how we might make a real change), this book is for you! Now available - 424 page paperback at Amazon.com (see link at left). Written in a narrative style, Revolution 222 unfolds neatly, with well-developed characters and vivid imagery into a real page-turner. In fact, it was published pro-bono by a Santa Fe publisher simply because of its powerful message. And that message is made crystal clear by its author Robert Fenstermaker, whose character is somehow intertwined with the book's main player Bob Windowmaker. Revolution 222 is probably one of the most relevant books written, and considering it was written over the course of some years, one wonders how the author knew what would be relevant today. Issues such as individual responsibility, sovereignty, freedom, big government, anarchy, revolution, love, respect, money, God, justice and peace cascade in a beautiful story about the main character Bob's quest to find happiness. Fenstermaker's lucid style and robust character development will no doubt attract those of us who love a good story and who are already on the same path to enlightenment, or know there's another path but just haven't found it yet. Difficult concepts take on an easy big-picture meaning as Fenstermaker weaves his tale of Bob's enlightenment and how it affected everyone around him, and in fact the entire world. Underlying the story are some very powerful messages; almost a call to action, speaking to each of us to wake up from our current nightmare and dream a new dream, one that puts people above money and politics. A dream that takes us to the tipping point of a new way to live and a new philosophy that includes us all, not just the chosen few. "The goal is to get into debt, spend, consume on credit, hooked, now feed the tax machine of the two party system, no two parties just the JUSTICE party….it ain’t you, it’s just us." "We believe we are a free society, but who controls the police, those dedicated to serve and protect, to protect us from ourselves? It seems to be that we all are terrorists, each of us under constant suspicion." Fiction it is, but make no doubt about this book; it's for everyone, not just those who seek another path. Should the events in the book actually happen, the world would be a very different place indeed. If there is a book that speaks for and to the 99%, this is it. Click on the links on the left to read the Author's bio, Book Forward, Book Excerpt or buy your paperback copy at Amazon.